Folks in the mining village of Wasmes, Belgium met their young lay pastor in early 1879. Strongly sympathetic to the needs of the miners and their families, van Gogh lived among them, giving away much of his own food and clothing. His supervisors did not understand Vincent's actions, and they terminated him at the end of a six-month probation period. Undaunted, the now-discharged pastor moved to the nearby village of Cuesmes where, during the summer of 1880, the Charles Decrucq family allowed him to share a small room in their home. Without financial means, he could no longer help the mining families even though he remained part of their community. Feeling compelled to visit Jules Breton, a French artist whom he admired, Vincent walked seventy kilometers to Courrières, France. 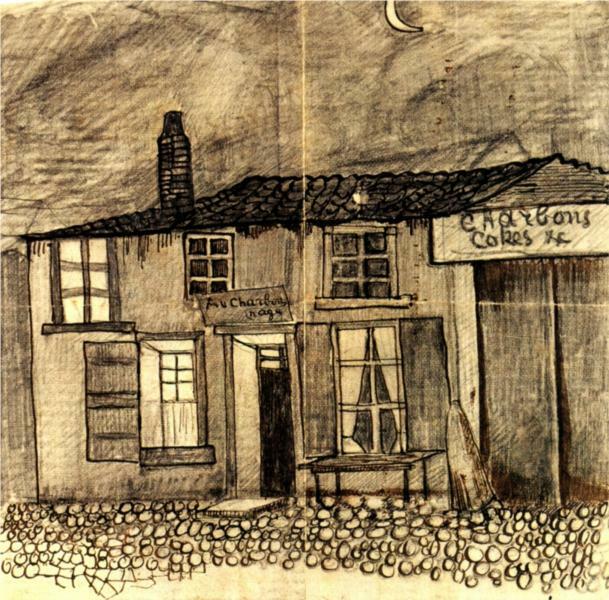 When he arrived at Breton's home, van Gogh could not make himself knock on the door. He returned to Cuesmes without ever speaking to Breton. One may wonder what Vincent could have accomplished with such a fruitless trip. Yet ... something had changed. Back in Belgium, van Gogh studied the mining families from a different perspective. He began to draw them and the conditions in which they lived and worked. [H]e began his painter's career with the first original drawings of miners going to work in the early morning. Bos, Carole "AN ARTIST IS BORN" AwesomeStories.com. May 01, 2008. Apr 19, 2019.